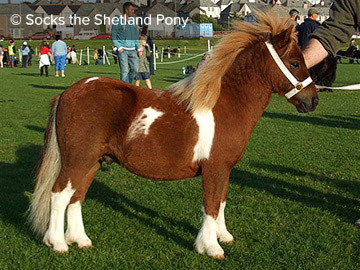 In July 2009, Socks came to Shetland. We (Socks & I) hit it off straight away. Socks soon settled down to life in Shetland. Enjoying the company of this other Shetland pony friends Swarthoull Marshall, Merrylees Nuggett, Hermits Pedlar & his best buddy Hughie the Highland pony. In fact, Hughie & Socks came up on the boat the same night so they've been firm friends since they met. Sometimes, animals from south can take a year or so to acclimatise to the Shetland weather but it was no problem for Socks, he wintered really well with a thick coat, plenty of hay, pony mix/nuts & the odd carrot!